Super Soakers, cream pies,and rotten tomatoes also deemed appropriate. 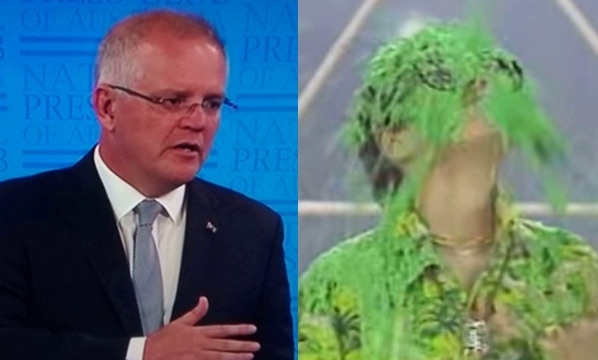 Fed up of copping his lies sweet, Canberra’s Press Gallery journos have got the right idea by showering the PM in green slime every time he lies about the government’s climate policy. As a result of the repeated slimings, his response to a question about climate change at today’s Press Club appearance took more than six hours. According to two articles in The New Daily, one from October 2018 called Scott Morrison Is Either Lying About Carbon Emissions, Or Just Plain Ignorant, and one from December 2018 titled PM Swears We’ll Make Paris Climate Target ‘At A Canter’. The Numbers Beg To Differ, the PM can’t open his mouth on the issue of climate change breaking PPS records (Porkies Per Second). As a result, New Daily journos such as Quentin Dempster have opted for green slime as the only rational response to the repetition of outright lies. A transcript of the interchange is recorded below, including all the times Dempster slimed the PM. Dempster: You’ve recently been to Townsville and Tasmania to comfort and support Australians suffering from wildfires and unprecedented inundation and flooding. Now, insurance actuaries are constantly revising risk assessment and are now factoring in climate change as an exacerbating factor in the higher frequencies of extreme weather events. Do you acknowledge that climate change is now the major factor in more frequent extreme weather events, and if you do, doesn’t that mean that Australia’s national disaster response needs a greater national coordination than what you’ve been able to announce under the national security umbrella that you’ve canvassed today? Morrison: I don’t know if I agree with your reasoning. We have a clear commitment to reduce emissions to 26% by 2030 (slime). So that is our response (slime). We are taking action on climate change (slime). We do have a response in place (slime) to address the very real threats of climate change that you’ve articulated (slime). So the actions that we’ve taken to address climate change have been taken (slime) and we are meeting the commitments we’ve made up until right now (slime) when these very events that you speak of are occurring. So my answer to that is – we will continue to take action (slime)…we believe you need sensible, achievable targets to address climate change (slime), and we have them (slime) and we’re achieving them (slime). So you have real targets with a plan to meet them (slime). That’s our policy on climate change (slime). Or you have reckless targets (slime) that shut down the economy (slime) and cost Australians their jobs and their livelihoods (slime). That’s Labor’s plan (slime). Quentin Dempster, thanks to your solid question and vigilant sliming, you are now a national hero.